My name is Nadine Helfenberger, 30 y.o. I am a passionate traveler and gypsy of the world. Since my childhood I have always dreamed about discovering foreign countries and cultures and about living in a van roaming the planet. My favourite countries ? Brasil, Thailand, Australia and Ecuador. So far I have visited several countries, but the world is so big! There are still so many places to explore! Next on my list are Nepal, Sri Lanka, Myanmar, Iran, Iceland, and Mongolia. 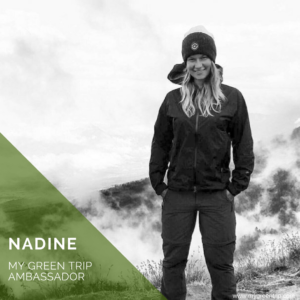 I am working as a volunteer for My Green Trip, writing articles and helping in the communications team, spreading the good intentions & vibes to make this world a cleaner and better place. Join us!! What inspires you to travel and explore the world? I think what mostly is addictive to me is the feeling of stepping into the unknown, of getting out of my comfort zone every day and not knowing what will await me next. It makes me feel alive. I also love to have no plans and to just do what I please, and of course the feeling of awakening every sense of the body again, by exposing it to a million of new impressions, sensations and feelings. I think that every time you explore a new place you also discover a bit more of yourself. What do you always take with you on your travels to limit your impact on the environment? I always carry around a refillable water bottle everywhere I go. In less developed countries it can be quite a struggle to find refill stations but I just try my best and never stop asking for refill stations. We should never underestimate the power of demand. Where there is a demand there will be a service provided for it. So keep asking for refill stations! Which environmentally friendly projects have you encountered that have particularly inspired you? The list is long, but one of the projects that I have encountered which has definitely inspired me to take action against waste pollution and to join the team of My Green Trip is https://trashhero.org, an organization that creates sustainable, community-based projects that remove existing waste, and reduce future waste by inspiring long-term behavior change. During my travels I have helped to clean some beaches in Thailand together with their volunteers. Another special place that has totally won my heart is http://secretgardencotopaxi.com, an award winning traditional eco-friendly mountain lodge nestled in the high Ecuadorian Andes overlooking the highest active volcano in the world. Go check it out; they have an amazing garden and even a composting toilet! If ever in Ecuador, you should definitely not miss it! Which place on the planet that you visited has struck you the most and why? One of the places that have struck me the most in both good ways and bad ways was South East Asia, with its beautiful beaches, landscapes and amazing cultures, but at the same time so much waste pollution everywhere. In those countries you can actually SEE the waste problem. Of course it seems to be a bigger problem than in other parts of the world, but I believe that the waste problem is everywhere, it just isn’t that visible to us in developed countries. But the problem is there and we should all take action to reduce our waste creation, everywhere in the world.